eaw029709 ENGLAND (1950). 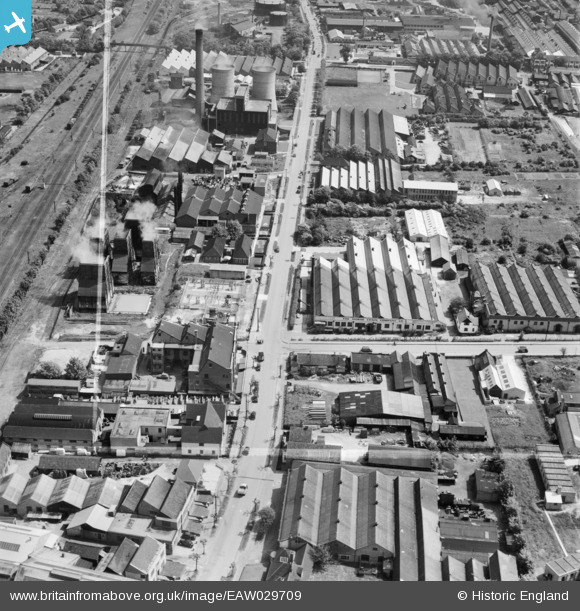 The Morse Chain Company Ltd Works, Works Road and environs, Letchworth Garden City, 1950. This image was marked by Aerofilms Ltd for photo editing. Title [EAW029709] The Morse Chain Company Ltd Works, Works Road and environs, Letchworth Garden City, 1950. This image was marked by Aerofilms Ltd for photo editing. A strange place to leave a wagon or is it in motion? Being "fly shunted" where the loco gives the train a push and stops suddenly so as the uncoupled wagon rolls on into the required siding.